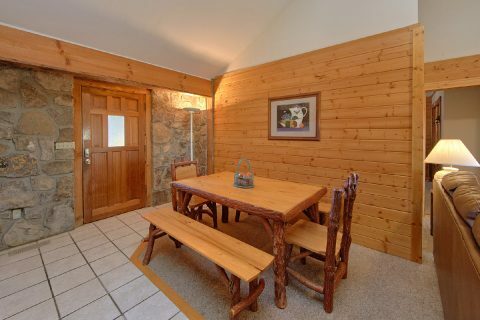 Welcome to "Mountain Destiny," a spacious 4 bedroom cabin rental with room for up to 11 guests! 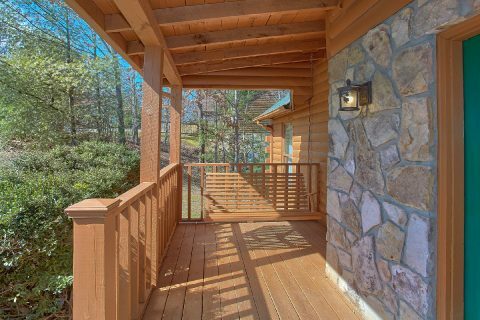 This cabin boasts a prime location in the Eagles Ridge Resort community in Pigeon Forge, so guests can enjoy staying only a mile away from the action-packed Pigeon Forge Parkway! 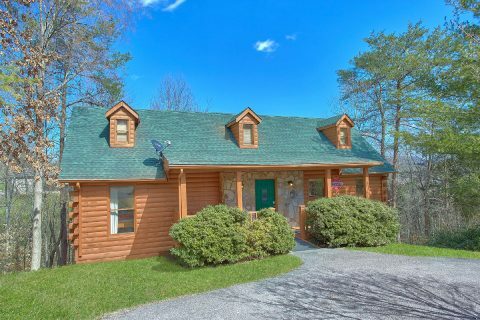 When you aren't out enjoying fun attractions like Dollywood or seeing hilarious dinner shows, you'll love relaxing at this log cabin with your friends and family. 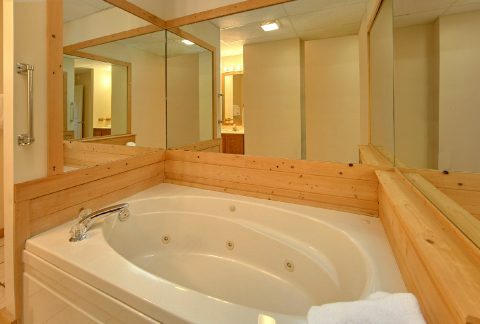 Better yet, you can enjoy comfortable amenities during your stay like the seasonal resort swimming pool, where you can cool off in the warm summer months with a refreshing swim. 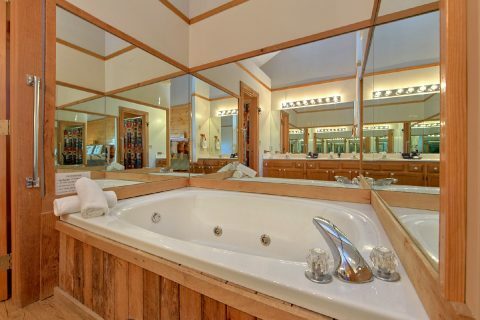 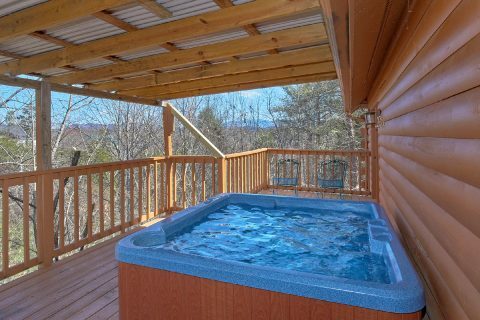 At your own cabin in the Smokies, you can always take a relaxing soak in your rental's hot tub or jacuzzi. 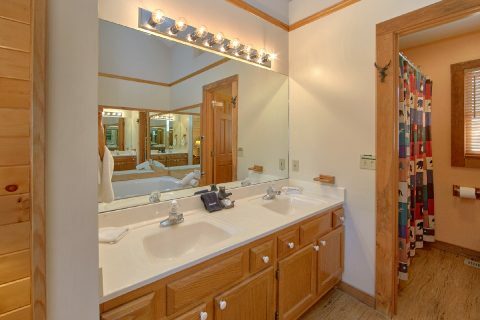 With your cabin's multi-game arcade game, you'll have a blast trying to set the high score! 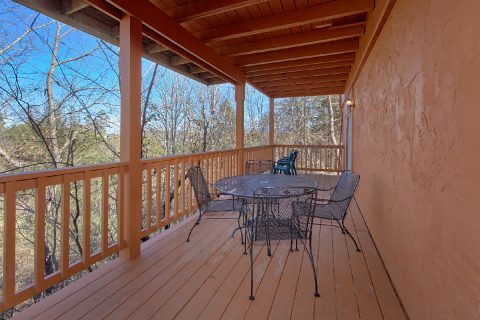 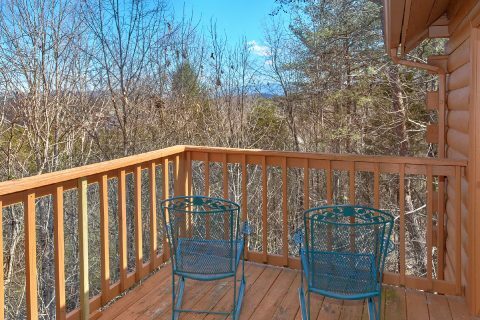 Additionally, this rental offers a deck with wooded views and a living room with a gas fireplace, excellent places for spending time with the people who matter most! 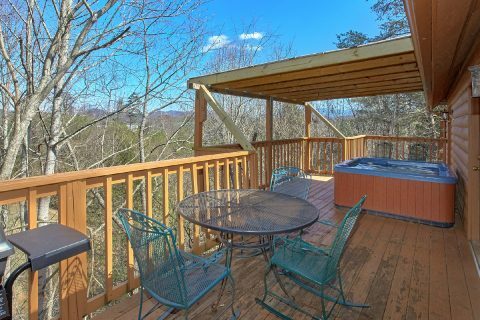 This affordable cabin also comes with all the comforts you need for your vacation in the Smokies. 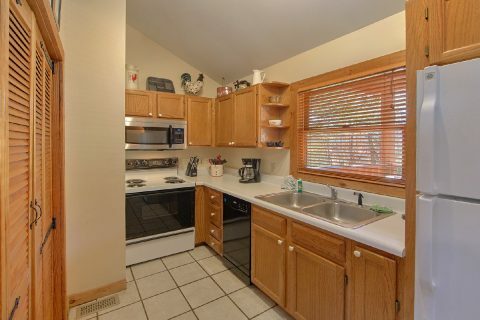 The fully equipped kitchen gives you the option of preparing cost effective meals during your stay. 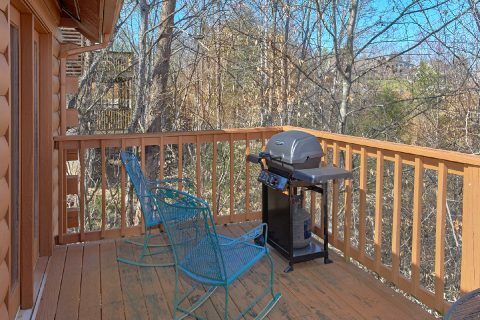 The cabin's gas grill also gives you the option of preparing some delicious steaks or burgers in the great outdoors. 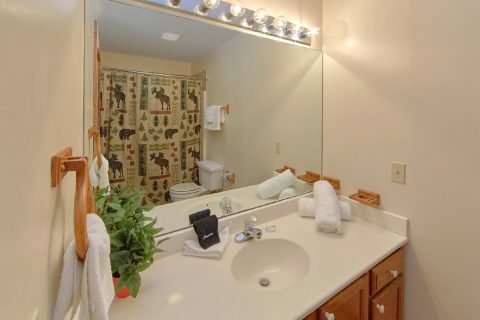 Lastly, this rental provides wireless Internet access and a washer/dryer for guests to use. 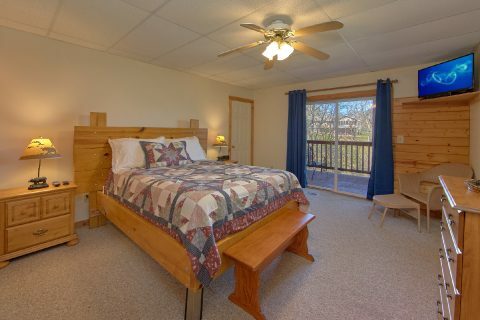 After a great day of hiking in the national park or seeing entertaining shows in Pigeon Forge, you'll want to get a good night's rest! 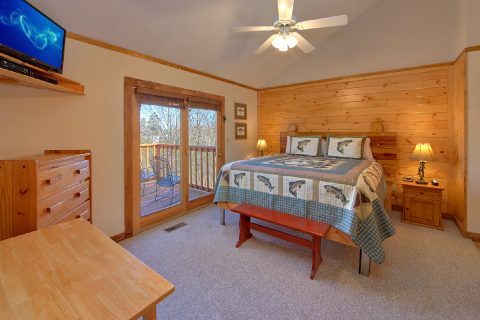 With 4 bedrooms, this cabin can accommodate up to 11 guests in comfort. 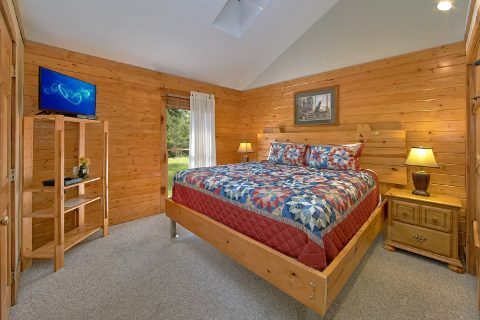 Altogether, there are 2 private king-size bedrooms and 2 private queen-size bedrooms in this cabin. 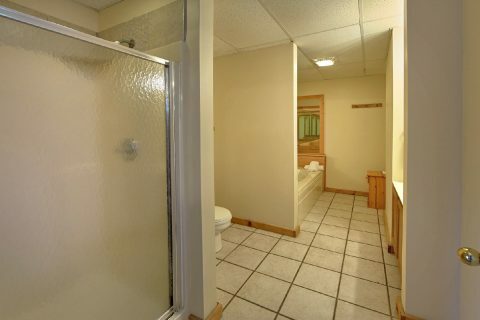 For extra guests, this rental offers a queen sleeper sofa and a twin sleeper sofa. 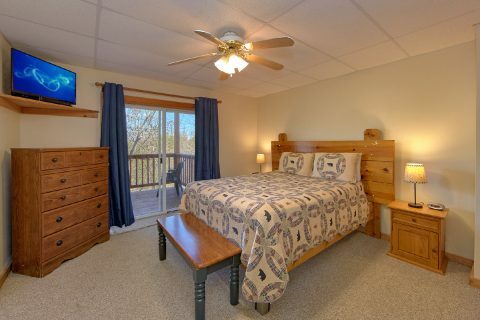 If you need more space for your group, we offer several other cabins in the Eagles Ridge Resort area that can be booked together. "Mountain Crest" and "Mountain Fever" are two 4-bedroom cabins that are particularly convenient to this rental, so feel free to contact our reservations office for help in planning your multi-cabin vacation! 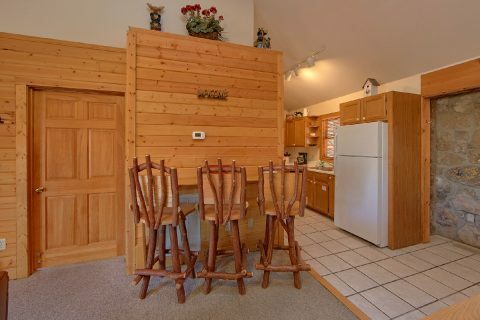 Best of all, you can save big on your Smoky Mountain cabin vacation by reserving this cabin with Cabins USA Gatlinburg! 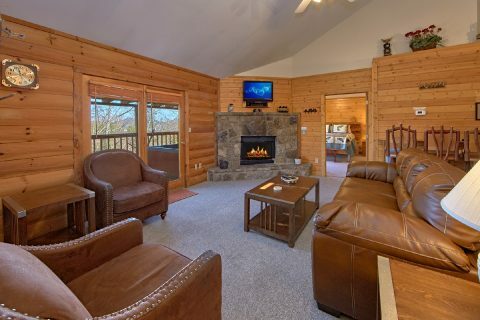 Book "Mountain Destiny" today to save 15% on your nightly cabin rate!